Siemens will deliver a cloud-based energy monitoring system that will be deployed in Rexel Austria logistics center in Weisskirchen. The system is expected to reduce annual energy consumption by up to 15 percent, an amount equal to the annual consumption of 40 single-family households. The scope of supply includes 66 communication-capable 7KM PAC 1500 and 7KM PAC 4200 power measuring devices, power manager energy monitoring software, and connection to MindSphere, the IoT (Internet of Things) operating system from Siemens. A separate app, which is programmed by Siemens developers in Austria in close collaboration with Rexel, analyzes current power consumption values and makes the savings potential visible only to Rexel. Siemens is not given access to the data. In this way, Siemens is helping Rexel efficiently control power usage while also developing a new business model: Rexel is planning to use this technology at another site belonging to the company and, in the future, sell the energy saving solution to other SMEs in all industries. Industrial plants and commercial buildings such as data centers, office complexes, shopping centers, and logistics centers are an energy system's largest consumers. Operators are faced with the challenge of using power as efficiently as possible so as to reduce consumption and thus reduce costs. "The EU Energy Efficiency Directive provided the necessary impetus for a proper development," says Michael Hauser, head of the Industry Business Unit at Rexel. "A 15 percent reduction in energy consumption is a respectable amount for a high-bay warehouse. We're pioneers in energy management and have also discovered a new business model." The measuring devices record energy flows in Rexel's central warehouse around the clock. The sensors and measuring devices are connected to MindSphere and supply data on how much energy each machine is using for each activity. This data serves as the basis for operational energy management according to ISO 50001 and can be used in various energy consumption analyses. Rexel is one of the very first companies to transmit energy data to the MindSphere IoT platform. 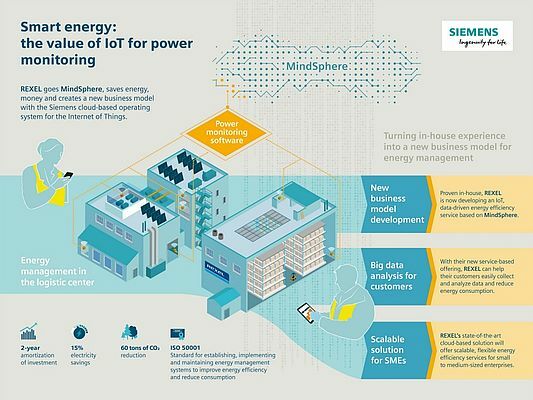 MindSphere is Siemens' open, cloud-based IoT operating system that connects products, plants, systems, and machines and makes it possible to use the massive amounts of data from the Internet of Things in comprehensive analyses. Thanks to a specially developed app, data analyses are now possible in the cloud and the optimization potential is tremendous: Rexel currently consumes 1.4 gigawatt hours (GWh) of electricity and 1.3 GWh of thermal energy per year. Using the new energy technology, it can save roughly 150,000 kilowatt hours (kWh) of electricity per year with no loss of quality or convenience – not to mention the expected savings in thermal energy. Rexel can now use the experience it has gained with Siemens in the course of optimizing its own energy use for a new line of business: "For advising industrial and commercial customers," says Christoph Czaby, Business Manager Energy Solutions at Rexel Austria. "To make the system more user-friendly, we're working with Siemens in Austria to develop our own application – or MindApp – for MindSphere that supplies the collected energy consumption data to customers in a simple and straightforward form." The MindApp should be ready for use by the summer. The Internet of Things is much more important for small and medium-sized companies. "SMEs don't have the large IT departments and computing centers that exist in larger companies, so they have to be able to rely on expert partners such as Siemens with its MindSphere. There they can precisely analyze their data and develop recommendations for action," explains Rainer Brade, Product Manager for Energy Monitoring at Siemens Austria. Rexel will now be installing the system in its central warehouse in Bad Hersfeld, Germany. The infrastructure of the warehouses is very similar, which allows precise comparisons for the purpose of further process optimization.